1. We have often heard corn rootworm larvae are not fond of sandy soils. Do you recommend a rootworm trait(s) in continuous corn acres grown within sandy soils? The risk would be reduced in any kind of sandy soil environment because as rootworms move through the soil, the sandy texture abrades their soft exoskeleton. Even in a continuous corn situation, larval mortality would be pretty high. However, it is tough to make a recommendation without knowing what the adult population was like in the field last year. You may need to dig deeper with the grower or agronomist to understand what adult populations were like this past August to determine whether or not a trait is needed. Another risk factor to consider, if the grower can’t remember whether or not they saw a lot of adult rootworm beetles, compare the planting date of the field to others nearby. Later planted corn tends to attract more adult beetles than neighboring fields that were planted earlier. 2. What is the rootworm risk in non-sandy soil that has previously been in continuous corn, but then soybeans last season? Is a rootworm trait(s) recommended when the field goes back to corn after one year of soybeans? The location of the field will determine a lot of the risk. 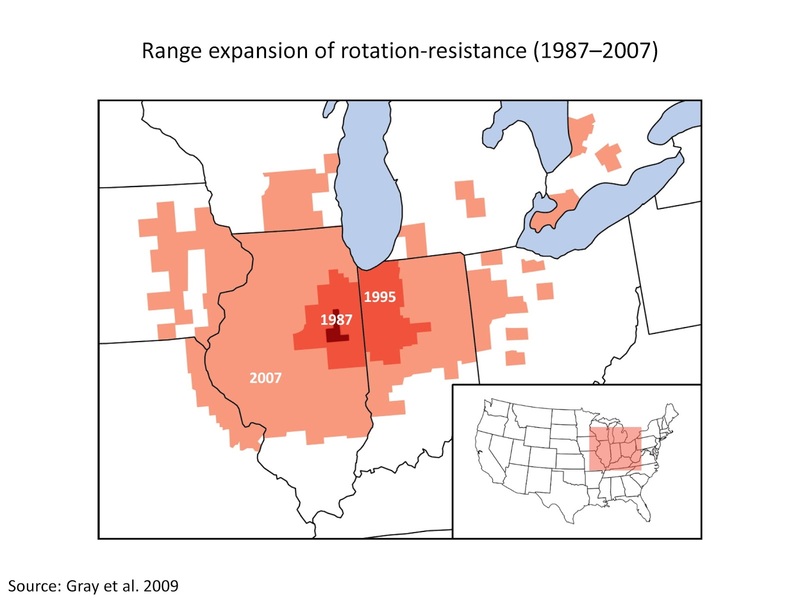 If the field is located squarely within an area where corn rootworm has been found to have rotation resistance, then there may be need for a rootworm trait. Generally, this would be the northern 3/4 of Illinois and Indiana, the eastern 1/5 of Missouri and Iowa, and the southern 1/3 of Wisconsin. Even within this area, rotation will reduce the population by about 50% because adults lay their eggs in both corn and soybeans. This should mean the population will be reduced even in corn following soybeans. Without some idea of what the adult population was like in August last year, it’s really tough to make a blanket recommendation. In 2017, rootworm populations seemed to increase somewhat based on University surveys in east-central Illinois (e.g., Livingston Co.) and west-northwest Illinois (e.g., Knox Co.). You can learn more by going to Increased Insect Densities Reflected in Annual Corn and Soybean Survey. Of course, any first-year cornfield will not have issues if it is located outside of the area where rotation resistance is a concern. Unfortunately, this is really a tough insect to get a handle on without some kind of in-season insect counts.